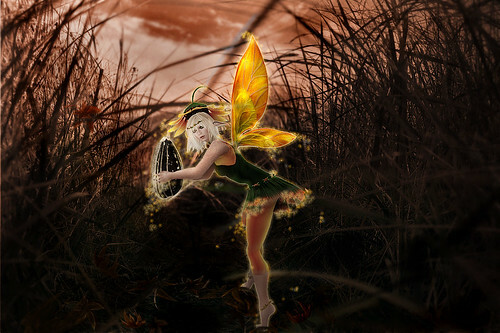 Sunflower Fae, originally uploaded by ~sierra sugar~. Never before seen, this Sunflower Faerie was caught on camera planting a seed. Both the fae and photographer were equally surprised by their mutual discovery, causing that moment of startled indecision. Sadly only this single still image was captured. As soon as she realized she was spotted the fussy little fae buzzed around the camera holder furiously then flew off. Most humans are clueless and don't realize that while the world is settling down for a relaxing evening, the fae are busy in hidden places making the world a beautiful place. So the next time you're sitting on your porch sipping your iced-cold tea and watching the sun set, see if your eyes can spot one of these busy little creatures at work. Just make sure you don't let them know you see, because as cute as they appear they aren't always so cuddly. It's been a while since I've done any updates at either location. But new stuff is on the way. Time to start clearing out some of the old stuff to make room for new. This week at the eMOTIONS annex location at Magic of Oz everything is 1/2 off. Also, there is a new super cute bunny pillow with singles and couples poses (menu driven). And don't forget to find the matching little bunny slippers in either red or blue. Also, its time to start gearing up for the holidays. I will continue the "A Gift for Everyone" project again this year. If you're not familiar with this project, please read about it here and spread the word. 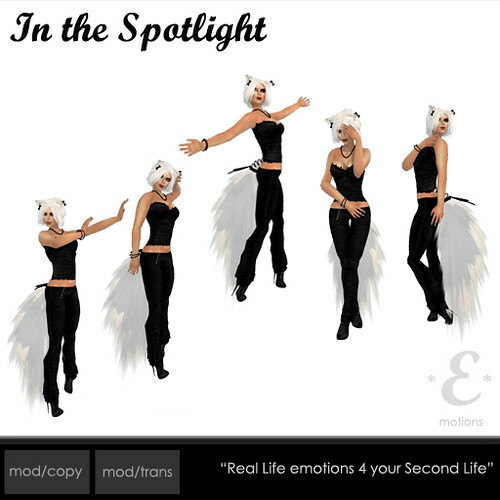 Real life emotions 4 your Second Life. I love that song. It brings back some wonderful memories. Even though that time has passed and the person I shared it with and myself have moved on, it still is one of those songs that brings a smile to my face and warmth to my heart. Our Time. That's what we had. And I'm hopeful somewhere down the road there will be special someone to have time with again. But for all of you out there who have that special someone, this pose is for you. For your love. For your hopes. For your dreams. For your time, alone, together, in peace and happiness. Our Time, that perfect pose to sit and talk about everything and nothing. Our Time, when it feels like home simply because you are together. Our Time is part of the Pro Posers Hunt #3. Be sure to follow the hunt and blog here. Don't miss out on all the wonderful gifts you can find during the hunt. Join the Pro Posers group to take part in the hunt as well as get special group only gifts and discounts. 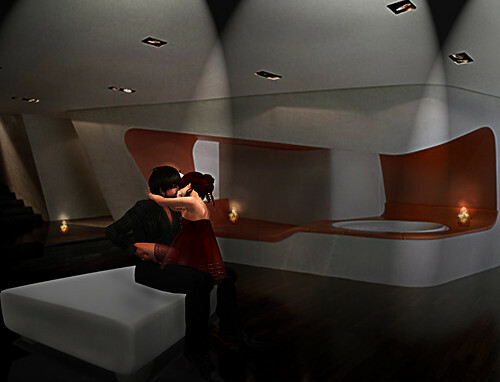 eMOTIONS - Closer, originally uploaded by ~sierra sugar~. Closer is another new release making its debut at Pose Fair 2010. Sometimes no matter how close you get, you still need to get closer. Closer is an all-engaging, wrapped up in you, need to be as close as i can, right now kind of kiss. A bit of a story behind this pose, if you all will indulge me. Back in the early part of 2006 (no snickering at the old lady here ok) I was lucky enough to meet this amazing man in SL, Thor Bishop. Those of you that know me have undoubtedly heard many stories about Him. Here is one that I've not shared before, atleast not in as much detail. I've always been a very shy person, reserved and private in relationships, and I'm not one to kiss and tell. But this pose is inspired completely by the very first kiss Thor and I shared that week we spent together in late December. Thor and I met in real life after Christmas of 2006, and from the first moments we knew this was meant to be. I remember standing in front of Him, between His legs as He was sitting, and He was STILL taller than me! That gave Him a good chuckle. I remember when He touched my cheek and told me to "come here". I answered shyly, "I AM here." He placed His hand at the back of my neck and pulled me closer so we were literally nose to nose and winked at me. He had this crooked smile when He said, "No, I mean here." And then He kissed me. Any fear, shyness, or doubt that I had vanished. You can laugh all you want, but it was an instantaneous change. In that moment I knew He was all I needed. That first kiss lasted forever, and ended way too soon. We stood there, well HE sat, in the room, the doors wide open to the whole world but completely lost in each other. At some point I remember Him growling. *Laughs* Yeah the big man growled. Grabbed me behind my knees and pulled me up into His lap. I can honestly say it was the most intense, passionate, loving moments I had ever experienced in my life up to that point. And all it was, was a kiss. Just a kiss, but to my heart so much more. Closer, always needing to be closer. In loving memory of my "Bear", my love, my one.